L W Bills Is Hiring! Ability to Read Blue Prints, Commercial F.A. Maintenance, etc. 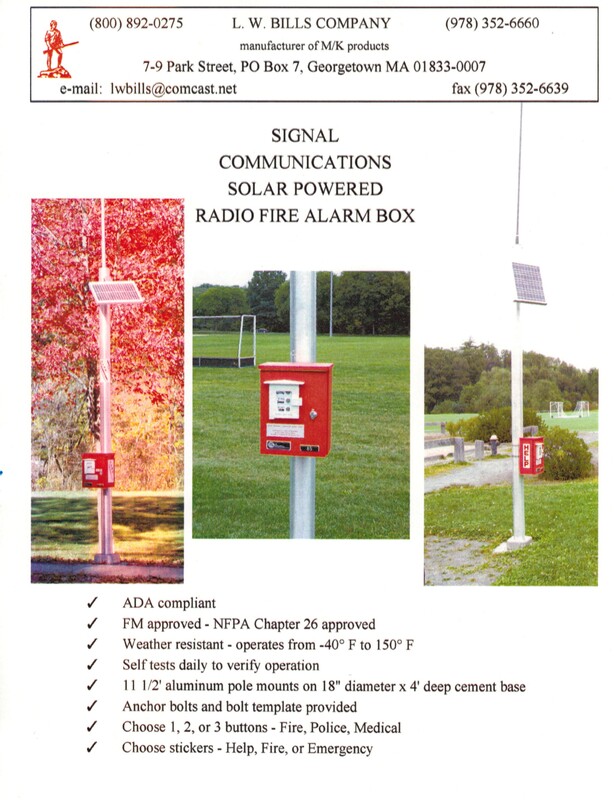 Mass Notification Siren Installed at Harvard MA Fire Department. L. W. Bills is your source for Radio Boxes. Check with the Fire Department in the town where the Radio Box is to be located for the correct type needed for your town/location. Click on the box picture above to get an overview and specifications. SigCom offers a variety of equipment used to transmit alarm messages, report incidents and control operations at remote locations. Alarms and control operations are communicated either via intelligent radio or fiber-optic networks. 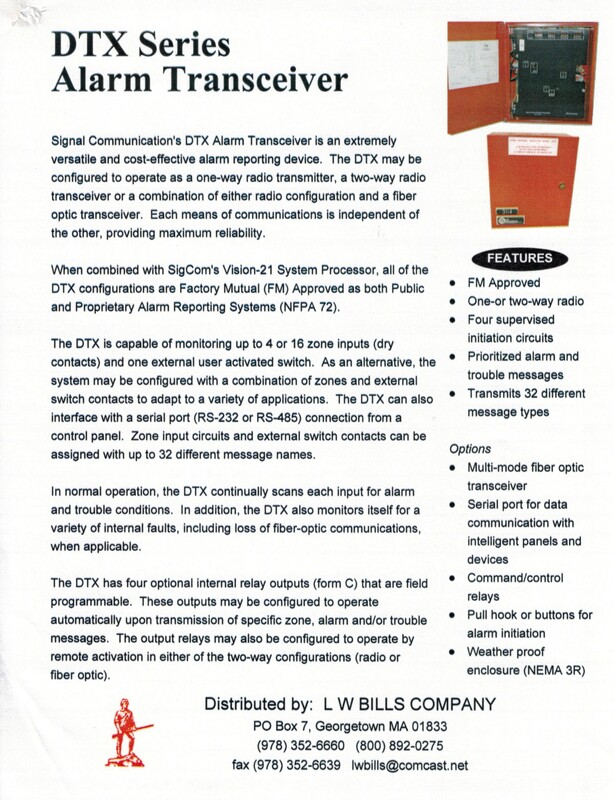 Centered around our Vision 21 System Processor, SigCom’s Alarm Reporting System is typically used for fire alarm, security and remote access, process control, and many other applications. The system includes all of the equipment necessary to provide a fast, accurate and reliable connection between a remote location and the control center. Its flexible and modular design allows it to cover a wide range of applications from a simple one-way reporting system to a sophisticated two-way command and control polling system. The programmable features of the system allow it to be uniquely tailored for any installation. SigCom’s alarm transmitters and transceivers are designed to operate in harsh environments and under extreme temperature ranges. The equipment may be powered by AC, battery and solar power supplies and is capable of monitoring and controlling devices that can be activated manually, through digital interface or by sensors and transducers. Two way communication allows for automatic or manual control of connected devices in response to an alarm or trouble condition, even if they’re at a different location. 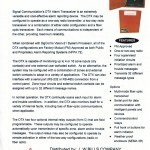 Download a Radio Box Programming Form click here. L.W. Bills Company has been involved in commercial and municipal alarm systems since 1925. We have been consulting, designing and installing public safety equipment and dispatch centers throughout our 85+ years in business and we gained the reputation of doing the job and doing it right. Our policy, and the most important aspect of our company, above all others, is service. Our firm manufactures many of our own products and is also the main distributor of public safety and alarm equipment for the following manufacturers; Zetron radio control consoles, Zetron fire alerting equipment, Signal Communications radio and wire line receiving / transmitting equipment, M/K municipal fire alarm equipment and commercial fire alarm equipment. We have full machine, sheet metal and paint shops on site. This allows us to custom fabricate all metal works needed for any job. We also have a full carpentry shop, as well as electronics and electrical shops, allowing us to custom build all console designs. This enables us to control our delivery and cost. In addition, we have a full complement of line trucks, hardware and wire to service any municipal fire alarm system. We hold a Massachusetts State Bid contract which includes all of our labor and materials, guaranteeing the best prices. The L.W. 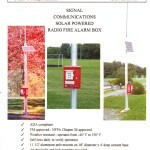 Bills Company also offers in-house classes on 100 milliamp fire alarm, radio box fire alarm, and commercial fire alarm. These classes are at no charge to fire and police personnel. If you desire further information, please do not hesitate to contact us. Thank you for the opportunity to be of service. L. W. Bills Co. technicians are trained and authorized to offer full NFPA quarterly, semi-annual and annual testing to insure that your system functions properly for the safety of your facility and for insurance requirements. L. W. Bills Co. designs, installs, maintains, inspects and monitors residential fire alarms for all sizes and types of applications. We specalize in Firelite and Notifier Systems. We also provide 120 volt smoke and CO detectors for home and property sales as well as low voltage devices tied into your home security system and monitored by our Central Station. L.W. 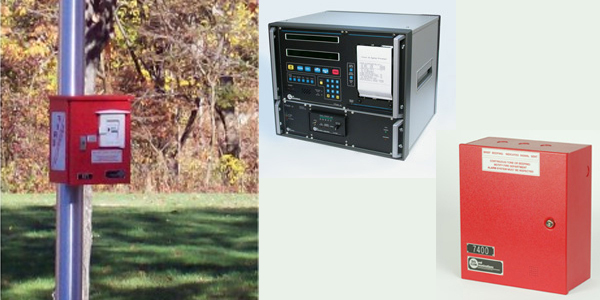 Bills Company manufactures and installs dispatch consoles for public safety environments. We have a long standing reputation for providing high quality, innovative console centers. We offer complimentary console and dispatch layout design for all of our emergency and command control workstations. Please call 1-800-892-0275 to set up an appointment for a consultation. Scroll through our portfolio to view samples of our work. O ur team of Master and Journeyman Electricians have over 100 years of combined experience in residential and commercial service and installations. From new construction to old work and additions we have the experience and expertise to get your project completed on time and on budget.